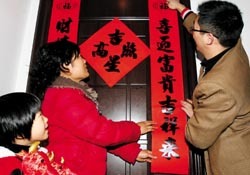 On the days before the New Year, Chinese families give their houses a thorough cleaning. Traditionally, this is done before the New Year’s arrival, because the Chinese people consider it very important to sweep away any bad luck that may have accumulated over the past year. 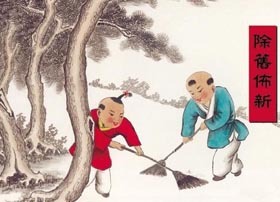 Besides, dust and dirt are associated with "old" in Chinese culture, so cleaning the house and sweeping the dust represent bidding farewell to the past and ushering in the New Year. Also, people will go shopping and buy new clothes for the festival. Chinese people believe that since this is a year anew they should buy a lot of new things. Purchasing new items symbolizes welcoming new things and getting ready for a new year. After the cleaning, people will decorate the house to welcome the Chinese New Year. Most of the decorations are red in color, which is a typical festival color traditionally representing pleased spirit in China. 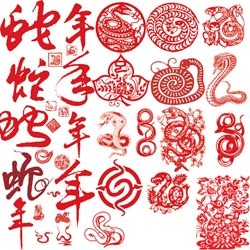 The most popular New Year decorations including Couplets, Paper-Cuts, the Chinese character “Fu”, The Gate Gods, Chinese Knots and red paper lanterns. In Chinese poetry, a couplet (duì lián 对联) is a pair of lines of poetry which adhere to certain rules. Outside of poems, they are usually seen on the sides of doors leading to people's homes or as hanging scrolls in an interior. Although often called antithetical couplet, they can better be described as a written form of counterpoint. The two lines have a one-to-one correspondence in their metrical length, and each pair of characters must have certain corresponding properties. In addition to pasting couplets on both sides and above the main door, it is also common to hang calligraphic writing of the Chinese characters for "spring," "wealth," and "blessing." 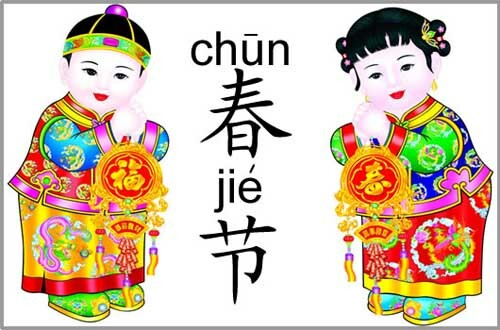 Some people will even invert the drawings of blessing since the Chinese for "inverted" is a homonym in Chinese for "arrive," thus signifying that spring, wealth, or blessing has arrived. Paper cut (jiǎn zhǐ 剪纸) is one of the most popular decorative Chinese handicrafts. It is low cost and artistry. Rural women often make paper cuttings in their spare time when farming is not busy. As a reflection of its philosophical origins, paper cutting is as comprehensive as it is attractive. Moreover, folk paper cutting conveys the content and nature of traditional culture with its own particular language. Paper cuts are popular because of their expression of wishes and hopes. 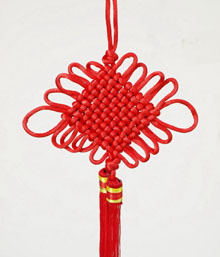 Chinese knots (zhōng guó jié 中国结) are prepared to decorate houses during the festival. Chinese knots were first used to string jade pendants on clothes as decorations and these knots were widely used in different places such as flute, Xiao (a vertical bamboo flute), curtain and so on as decorations. Now these knots are used as gifts containing the blessing for other people or decorations during festival. Fu (fú 福) , one of the Chinese characters that best epitomize China's time-honored culture, is a necessity in Spring Festival celebrations. Nowadays, fu, literally meaning, auspiciousness, blessing or happiness, usually appears as a cultural symbol to express people's wishes for the coming new year. It is often displayed upside down on the front door of a house or dwelling to signify that good luck came because the phrase "upside-down Fu" sounds virtually identical to the phrase "Good luck arrives." 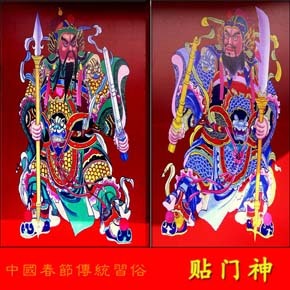 In China there was a prevalent custom of putting paintings of the Gate Gods (mén shén 门神) on the gates during the Chinese New Year. According to their roles, there are the main gate god, secondary gate god, back gate god and wing room gate god. The tradition of pasting the gate gods began during the Tang Dynasty and gradually people created the fortune gods also, as a gate god to bless people so they can have a fortuneful new year. Reunion dinner (nián yè fàn 年夜饭) is held on New Year's Eve of the Chinese New Year, during which family members get together to celebrate. 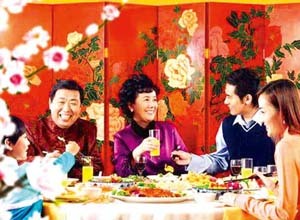 It is the most important dinner for Chinese and this is the best time for family reunion in the whole year, especially for those with family member away from home. Children are supposed to return to their families, married couples will go the the male’s relatives (and to the female's relatives on the second day of the festivities). In the New Year's Eve dinner, normally fish will be served. Dumplings are the most important disk in Northern China. These two dishes mean prosperous. Other disks are depending on personal preference. 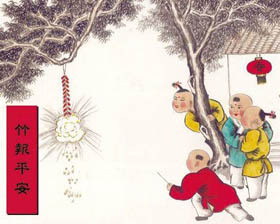 Firecrackers (yān huā 烟花) are always set off at midnight. In some places, people also set off firecrackers on the morning of the first day. The use of firecrackers can be traced to 2,000 years ago, when people threw bamboo into the fire to drive away a monster called “Nian”. After gunpowder was invented, firecrackers replaced the bamboo. Because fires can be easily caused by the firecrackers, many places ban firecrackers except in designated areas. However, people in small towns and rural areas still practice this tradition. Just as the clock strikes 12, beginning a new year on the Chinese lunar calendar, cities and towns are lit up with the sparkle of fireworks and the sound can be deafening. Families stay up for this joyful moment, kids with firecrackers in one hand, and a lighter in another, cheerfully celebrate by throwing the small explosives one by one on the street, whilst plugging their ears. Lucky money is prepared for children by adults and the elderly and given after the reunion dinner. There are no clear literary sources from which to trace the origin of the red envelope tradition. In China, during the Qin Dynasty, the elderly would thread coins with a red string. The money was called yasui qian (yā suì qián 压岁钱) meaning "money warding off evil spirits", and was believed to protect the elderly from sickness and death. The lucky money was replaced by red envelopes when printing presses became more common and is now found written using the homophone for suì that means 'old age' instead of 'evil spirits'. In folk culture, the children will live safe and sound for the whole year if they get lucky money. This custom still remains and the amount of money is increasing. Children use their money to buy books or other school supplies. Some families also save the money for future use or use it to help cultivate in their children the habit of saving. 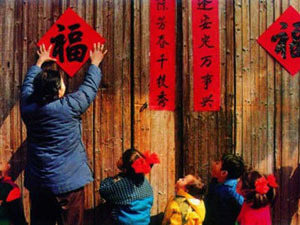 An important activity during the Spring Festival is Pay a New Year call (bài nián 拜年). People start to pay New Year calls from the lunar New Year's Day, that is, the first day of the first month of the lunar calendar. On the morning of the lunar New Year's Day, people get up very early and call on others. The earlier one does so, the more sincere he is. Moreover, people wear new clothes and a new cap, symbolizing that a new year has begun. The younger generation should call on their elders first, such as the grandfather, grandmother, father, and mother, wishing them "Good health" and "Long life". Then the elders give children some money in a red envelope as a New Year gift. After that, people call on their relatives, friends and neighbors. Nowadays, people also use telephones and e-mails to pay New Year calls. 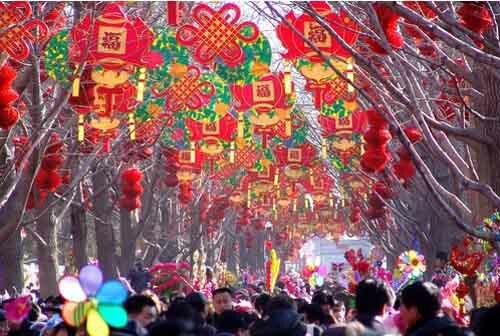 Temple fairs (miào huì 庙会) are another tradition of the Spring Festival, especially in Beijing. Although they originally were a form of worship connected with temples, now they are more like carnivals and are sometimes held in parks. Traditional cultural performances such as playing diabolo, Chinese traditional magic, puppet shows and so on can be seen. Besides, people can buy all kinds of daily using things at very low prices.